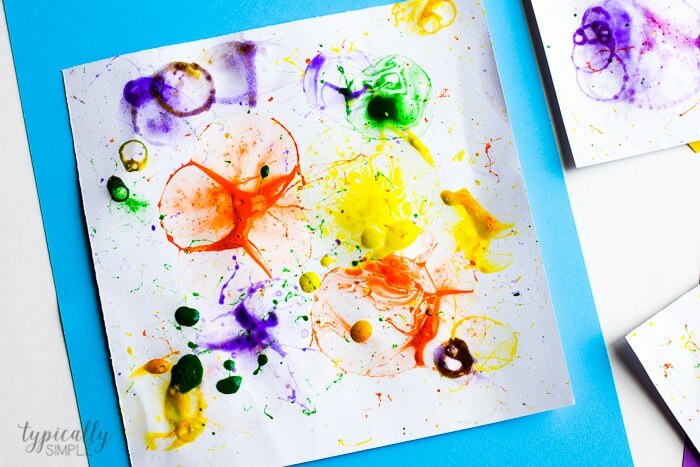 Bubble painting is a fun way to create art without a paint brush! 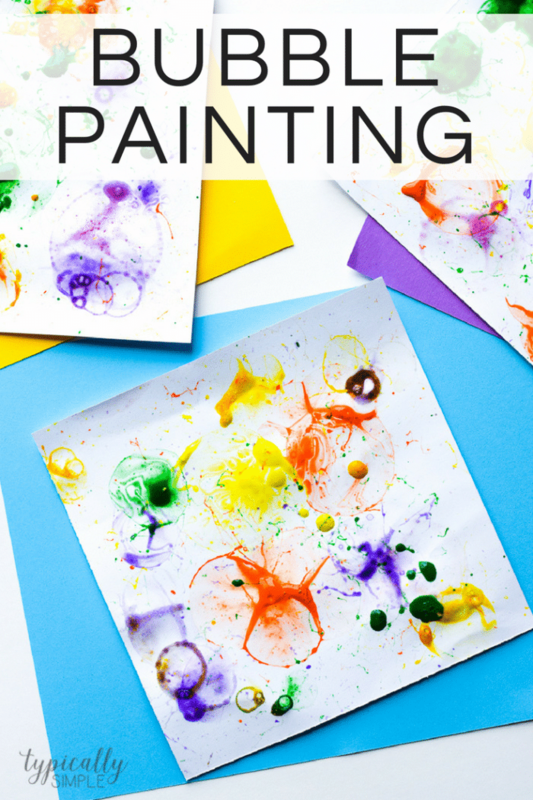 With just a few basic supplies, these colorful paintings are easy to make with the kids. It never fails that I always find bottles of bubbles that are half full and pushed to the back of a shelf or under all the outdoor toys in the garage. Usually I just dump them all into one bottle and call it a day, but those half full bottles are also perfect for doing some bubble painting! When we made this art project for the first time, I thought it would be a great for the little guy to use a straw to make bubbles in small bowls and then we could press the paper on top. But straws to him meant taking a drink of something, and let’s just say it did not end well. So instead of having him blow bubbles with a straw into a bowl, I grabbed all the wands so he could just dip those into the bubble paint solution and blow bubbles onto the paper. This way is a little bit on the messy side, but so much safer for the little ones who might accidentally drink the solution when using straws. Add three tablespoons of bubble solution and two tablespoons of paint to a cup. Mix the paint and bubble solution together. Place a piece of paper on the grass or a table. Dip the bubble wand or a straw into the bubble paint and then blow out bubbles so they land on the paper. Allow to dry before hanging up the colorful bubble paintings! Bubble painting can be done in the house, but I highly recommend covering the table or work area to keep the mess to a minimum. This can be a very exciting project for the kiddos and the soapy paint solution tends to splatter as the excitement grows! If you don’t have any pre-made bubble solution, you can easily make your own with a little water and dish soap! Combine two tablespoons of dish soap (Dawn or Palmolive work best) and one tablespoon of water. Use this project as an opportunity to talk about mixing colors. Have the kids predict what would happen if they mix yellow bubbles and blue bubbles, etc. 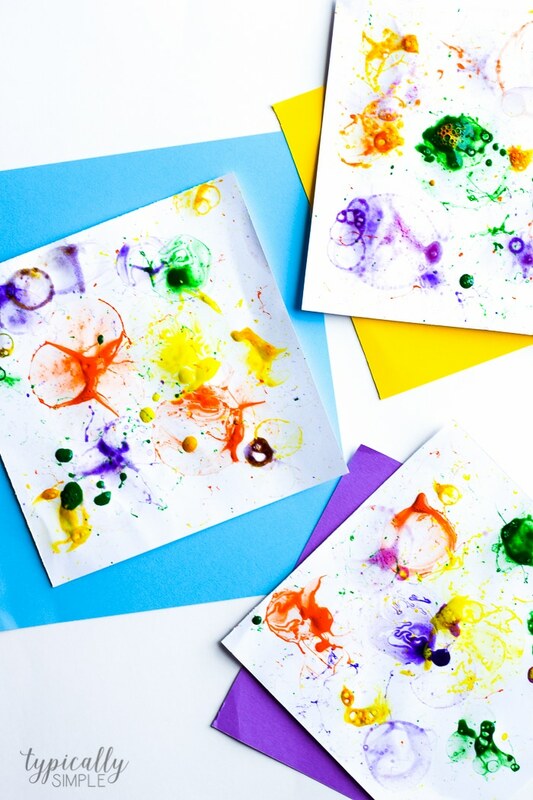 Turn the bubble painting prints into cards! Just fold in half or cut out some shapes to add to a blank card. Looking for more colorful craft ideas! Be sure to check these out!